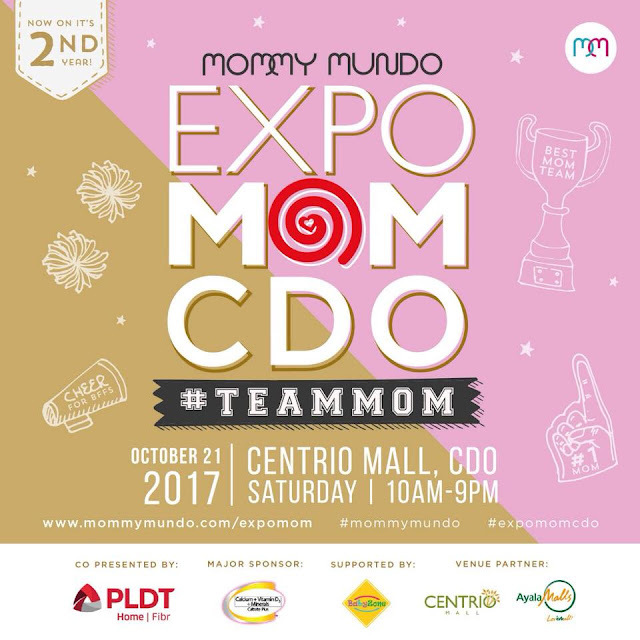 Home / Cagayan de Oro City / Events / Expo Mom: #TeamMom in CDO! The ultimate mommy event of the season comes back for the 2nd year in CDO! Expect to be inspired by the different #TeamMoms on October 21, 2017, at Centrio Mall, from 10AM to 9PM. Whether you're an expectant mom, a new mom, or a mom of three or four, you're going to find something to love at Expo Mom Cagayan de Oro. Expo Mom: #TeamMom features a fun and fulfilling all-day program. In the morning The Modern Nanays of Mindanao, a community of moms who promote breastfeeding, babywearing, and cloth diapering, lead the celebration of motherhood with a cheer dance to open the event. Then they will be showing their dance moves as they do a line dancing session with their kids! The other exciting activities scheduled include Body & Mind Wellness by One Yoga Studio, Easy Negosyo Recipes by Sweet House, How to plan a fab kiddie party by Kids & More and a #TeamMom talk show. We also have something in store for the kids namely: an arts & crafts area by Sisters Huddle, parlor games & puppet theater show in the afternoon. Topping the motherhood celebration is a talent show by Mommy’s. Showing that Mommy’s are not only the light of the home but they can very well shine on the spotlight as well! Expo Mom 2017: #TeamMom is co-presented by PLDT, with the support of Caltrate & Baby Zone, as well as Centrio Mall and Ayala Malls as its venue partner, with the cooperation of the Modern Nanays of Mindanao & Sisters Huddle. Professional Organizers Unlimited, Inc. and Creative Juice Communications are its logistics partners. Entrance to Expo Mom is free.